You have the ceremony organised and the bridesmaids booked. You've seen the perfect dress and to die-for shoes. Now you just need to find the stand-out jewellery and accessories. Cue copper wire hats, carrier bags transformed into fine lace corsages, concrete lace cake stands and gorgeous necklaces fashioned from rubber gloves and freshwater pearls. 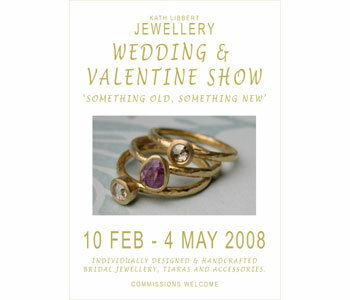 Welcome to the Kath Libbert Jewellery Gallery's 'Something Old Something New' - their 7th Alternative Wedding and Valentine Show. The Gallery, at Salts Mill in Saltaire, which has a strong reputation for finding and exhibiting jewellery that is both beautiful and unusual, is showcasing an intriguing collection of work that transforms unlikely materials into utterly divine adornments. Also on display are contemporary classics for men and women crafted from precious metals and jewels, including Edwardian diamonds, black diamonds, sumptuous Tahitian pearls and star rubies. 'Something Old Something New' is the Gallery's largest Alternative Wedding Show to date, featuring the work of more than 20 jewellers and designers, many of whom celebrate the possibilities of recycling materials to create unique pieces that range from quirky and cool to elegant and exquisite. Leading the eco-friendly/conscious' innovators is Laura Marsden, a textile designer who has developed an entirely new technique using hand stitching and needle lace-making combined with heat processes to transform recycled plastic bags into 'Eternal Lace', which is then sculpted into fine jewellery and delicate accessories. Inspired by historic costumes, her corsages are both beautiful and elegant; examples of her work have already been snapped up by the Victoria and Albert Museum for its collection. New graduate, Zoe Newsome's talent has been spotted by world-famous milliner Philip Treacey, for whom she is currently working on couture fashion shows. Her collection includes copper 'lily' hats and 'rose' corsages that take flowers as their inspiration, interpreted through wire as wonderfully wearable sculptures - transforming 'the perishable into the permanent' and celebrating flowers as a 'beautiful and positive symbol of life'. Majorca-based Stephanie Moog also works with humble wire, this time garden wire (reflecting Stephanie's 'other life' as a landscape gardener). She combines the wire with precious pieces of fine antique silks in pale pastels, to produce magical hats in the shape of miniature wedding dresses. For brides and bridesmaids, Sarah Collins and Sarah Lawrence use feathers, found shells, delicate silver wire and pretty stones to create delightful collections of tiaras, fascinators and jewels. If your wedding dress of choice is a plunging, backless number, then Min-Ji Cho's 'Angel Wings' will elevate the effect from daring to high drama. Min-Ji's utterly gorgeous necklace, which is made from precious pearls, silver and rubber gloves, comes draped around a mirror for added glamour - and a lovely reminder of your special day. Reflecting her interest in 'extending the potential of jewellery' and 'combining materials that represent the extremes of precious and non-precious', Min-Ji believes jewellery should be enjoyed as much when it's off the body as when it's on. Precious metals and sumptuous stones are used by Alexis Dove in her stacking rings featuring rose-cut diamonds, sapphires and star rubies, which are complemented by earrings and pendants. 'Designer to the stars' including Gwyneth Paltrow, Dawn French and Joan Collins, and long-time Gallery favourite, Malcolm Morris, has created a beautiful collection of contemporary rings, set with Edwardian diamonds; his own exquisite expression of the Show's theme of 'Something Old Something New'. Also look out for the very talented Natalie Jane Harris with her striking scratched finish 18ct and 22ct white and yellow gold rings set with glinting black diamonds. One of the Gallery's biggest ever collections of men's jewellery includes: Angela Fung's 'Glide and Slide' range of rings and matching cufflinks which use 'industrial inspired' stainless steel, titanium panels and 18ct gold rivets, combined with moving semi-precious stones; Beccy Gillat's stylish range of 'chunky' cufflinks, rings and pendants use sleek grey steel inset with geometric silver shapes; the organic, fluid curves of Hidemi Asano's jewellery are crafted in silver and golds; whilst renowned Birmingham jeweller, James Newman, launches his new range of men's rings in silvery grey palladium - a lovely material that looks like platinum but costs less than gold. And, if you are searching for that perfect wedding gift that will last for years - forget crockery, cutlery and crystal vases - look no further than Victoria Kershaw's concrete cake stands! Victoria casts delicate, filigree lace patterns into the concrete, which are echoed through into the silver servers, giving precious life and qualities to an unexpected material. Totally tactile, totally unique and a great talking point when used to serve your wedding cake! Artists featured in 'Something Old, Something New' are: Natalie Jane Harris; Alexis Dove; Mirri Damer; Malcolm Morris; Zoe Newsome; Jacks Design; Beccy Gillat; Angela Fung; Yoriko Mitsuhashi; Sarah Collins; Laura Marsden; Stephanie Moog; Min-Ji Cho; Victoria Kershaw; Hidemi Asano; Mikala Djorup; Tanja Ufer; James Newman; Ruth Tomlinson; Tina Engell; Catherine Mannheim; Sarah Lawrence; Diana Porter.